What would Henrietta Szold do? While building up excitement for their Centennial celebration, Hadassah, The Women’s Zionist Org of America was all abuzz about prayer services at the Kotel with Women of the Wall. Today, following the arrest of several participants and the violent detainment of Women of the Wall leader Anat Hoffman, Hadassah isn’t saying much at all. Nobody attends a Women of the Wall service without knowing that being arrested for wearing a tallit or praying aloud is a distinct possibility. At the group’s monthly Rosh Chodesh services, some women choose to save their voices and their prayer shawls for the Torah service that takes place at a nearby location. Others take the risk. Regular participants advise first-timers regarding how to avoid arrest. Meanwhile, Hadassah plans to present PM Netanyahu with an award named for Hadassah founder Henrietta Szold. What would Henrietta Szold do in such a case? Given that she struggled to be admitted to the Jewish Theological Seminary of America and was finally allowed to matriculate together with rabbinical students under the condition that she never ask to be ordained, in all likelihood she would have been at the Kotel, determined to find a way for women to pray there. At the very least, no doubt Anat Hoffman is correct when she says that the Women of the Wall organization is more deserving of the prize than Bibi is. The vision of Henrietta Szold, whose unique brand of leadership encompassosed the social feminist movement of her day as well as an inclusive, diverse vision of Jewish peoplehood, was much more akin to the work of Women of the Wall than to any aspect of the current Israeli government’s leadership. In any case, the women’s Zionist organization should not be silent now regarding this violation of the rights of women in Zion. 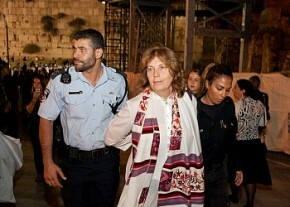 Police Shackle Anat Hoffman for Saying Sh’ma at Kotel – The Sisterhood – Forward.com. In Jerusalem, at the National Business Meeting of the Centennial Convention of Hadassah, the Women’s Zionist Organization of America, delegates unanimously approved a resolution reaffirming its commitment to and support for freedom of worship for women at the Western Wall. Thank you so much for this posting!! As a member of WOW and of Hadassah, this entirely saddens me. Other than the posting by IRAC re: Anat’s arrest, there has been little mention of the situation and RH this month. In Hadassah’s effort to remain apolitical, disinterest and a blind eye appears to be the flip side, which is disappointing. I didn’t know that Kim Kardashian works for the Israeli police. I fully support Women of the Wall and the rights they seek. I know most are earnest. But let’s be serious here. Why was Anat Hoffman davening in the evening while wrapped in her Tallit? It may have been intentional provocation or it may have been personal piety. I don’t know what Hoffman’s practice is, but in the suburban, American, Conservative synagogue where I grew up, it was common practice for the shalicha/shalicha tizzbur to wear a tallit, even at mincha/ma’ariv when no one else would. In just about every Conservative, Reconstructionist, and independent egalitarian minyan that I’ve ever been to in North America, Israel and Europe, the sh’tz wears a tallit in the evening. @Rifkele and dlevey. : Oh, so she was wearing it to lead the daveninjg? Guess again. The women did NOT daven Maariv. The women sang. And Anat sang the Sh’ma loudly (but not as part of the evening service). Fact- not my conjecture – they did NOT daven Maariv. So much for that explanation as to why Anat had a Tallit on at night. An, I am all for WOW but for the sake of the right of the women to daven in keeping with their approach. I am not in favor of creating a side show and circus. A Tallit for davening or for a Shlichat Tzibur is fine. As a media prop – sorry! She spoke to the visiting Hadassah women and showed them the tallit and how lately there seems to be a difference in how the women can wear tallitot without be hassled by the police. She kept it on as they headed into saying shema. She was a sh”tz of sorts, though the tzibur wasn’t davening ma’ariv. Did you know that the police did not allow distribution of prayer/song sheets? Shema was a fallback common denominator; something almost everyone knew. If you have a visiting delegation of 200, you welcome them and try to involve them. That doesn’t make it a media circus. What’s wrong with an act of prayer as a spark for a media circus? I don’t understand what’s wrong with that. I am a man. I cannot daven at the Kotel without some UO telling me that my prayers will lack efficacy if I do not donate a few shekels to their organization. They are quite generous; If I tell them I have no money, some one of them will come up with some to give to me so that I can give it. This whole process is highly problematic. It seems to hinge on the idea that the Judge of all the earth takes bribes and, indeed, must be bribed. And since the Torah teaches that a judge must not take bribes, the idea strikes me as a Hillul HaShem, suggesting that HKB”H is a corrupt judge. I am made uncomfortable by this practice, by being compelled to engage in this act of bribing G-d against my will, even with money that has been forced upon me. To whom shall I report my discomfort at this practice? Will the policemen at the wall arrest these individuals, laugh in my face, or warn me not to make trouble? 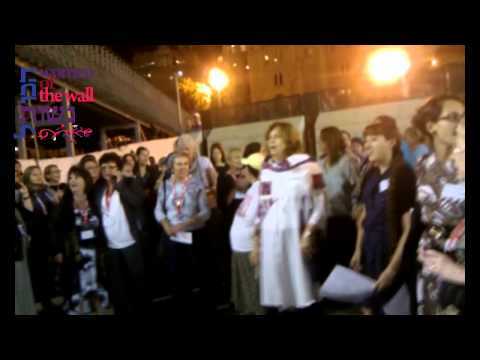 Seven busses of Hadassah women, still jet lagged from their recent arrival, attempted to join in support of the WOmen of the Wall that night. Only one bus had arrived before they began amd Anat was arrested. It did not stop the rest of the busses from coming and staying, some till till after 1 AM! I was even in the second bus. Ha’aretz printed Past Pres. Marlene Post’s quote about our disgust at the treatment of Anat Hoffman in jail and as for PM Netanyahu’s Award that night, he is the sitting PM of our beloved Israel and deserving of the Henrietta Szold Award. I regularly wear talllit and tefillin, but since there was no prayer service at night that obligates the use of those ritual accessories, I did not bring mine and I cannot imagine why anyone brought there’s as well. I suppose it would have made more sense for Anat to have waited until everyone arrived. I would have been amused to read about seven buses of American Hadassah members arrested along with Anat for singing aloud. Alternatively, I would have liked to have seen these women put their value and values into action for a change by staking their organization’s support on an important issue that has been supported through its own resolutions. Sadly that did not happen. Whatever you think of Bibi, this was Hadassah’s moment in the spotlight, and in the wake of an outrage, this was their chance to hold the PM’s feet to the fire. Some might argue that its not appropriate to so embarrass a sitting PM, others would rightly argue that in allowing the arrest, he already did that himself. Hadassah should have acted accordingly and changed its plans. The award should have been postponed as a result to demonstrate the membership’s dissatisfaction or at least as a means for members and leaders to ‘reflect’ on what had happened.